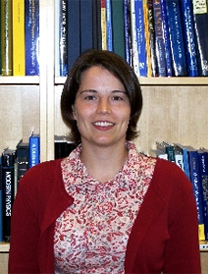 Sarah “Sally” Dodson-Robinson became an Assistant Professor in the University of Texas Astronomy Department in September 2009. Sally works on planet formation as well as more traditional astronomy topics such as protostellar disk chemistry, galactic chemical evolution, and brown dwarfs. In the interview below, I asked about the role that fellowships have played in her career, what it’s like to teach solar system classes in an astronomy department, and more. I hope you enjoy meeting Sally — I know I did! Let’s start with an abstract of some recent work. What have you published lately? Great! Would you answer some questions for our readers? 1. How did you first become interested in space science? I almost can’t remember a time when I wasn’t interested in space science. When I was 7 or 8 years old, I joined the Planetary Society and collected the mini-posters of planets and moons that came with the magazine. Then my dad went on a business trip to Washington, D.C., and brought back a Voyager II poster book he picked up at the Air and Space Museum. I spent almost all of my spare time poring over the book, memorizing the planet and moon facts on the back of each photo. I used to quiz my family at the dinner table about which moon was the biggest in the Solar System, or which planet had a sideways rotation axis. 2. Tell us a little about your time in graduate school. Did the NSF Fellowship positively benefit your experience? I have to first tell you a bit about my undergrad days, because by then I had gotten off the astronomy track. By the time I went to college I had decided that I would get a job in industry. I still liked astronomy, but I didn’t know it was a “real” career path. I also liked photography, so I decided to get a degree in Imaging Science. Then I could go and design printers for Kodak or chips for Intel. I didn’t start thinking about grad school until my junior year. There were a couple of astronomers on the Imaging Science faculty and I got a job with one of them reducing observations of binary stars. Once I started doing the research, making it part of my day-to-day routine, I hardly wanted to do anything else. My advisor told me I could be a “real” astronomer and make it my job by getting a Ph.D. in astronomy. When I applied to graduate schools, I was not at all confident that I would be accepted anywhere. Imaging Science is an unconventional bachelor’s degree for a grad student in astronomy; most students study physics or astrophysics. I was extremely surprised when I was accepted into all the schools I had applied to but one. I chose UC Santa Cruz because it had an active research program on exoplanets and the Solar System, and because Santa Cruz has good weather. I was very tired of the cold, gray Northeast. My ability to choose my own thesis project was a direct consequence of receiving the NSF fellowship. All the chapters in my thesis were projects that I designed, which made me very heavily invested in the outcome of the research. My advisor actually had enough funding that I probably would have been okay without the NSF fellowship, but I would have done more TA-ships and I would have had to make sure my project fit into an existing grant. 3. How did the Spitzer Fellowship help you start your career? In my final year of grad school I applied for 17 jobs, which is actually a modest number compared to some of my colleagues. Most of the applications I did were for postdocs, but a few were for faculty positions. My goal was just to get on a faculty shortlist and experience the interview process; I had no thought of getting an actual offer. The first postdoc offer I received was for the Spitzer Fellowship, and I was first relieved to have any job offer at all, then excited because it was one of my top choices. I would take the fellowship to the NASA Exoplanet Science Center where I could continue working with one of my Ph.D. committee members and the team at JPL with whom I collaborated on my thesis. After I accepted the Spitzer Fellowship, I found out that I had made the shortlist at University of Texas. I was extremely surprised, but I knew I had a fantastic opportunity. I went into the interview in a great position, since I was not yet at the point in my career where I absolutely had to get a permanent job. If I got one, great; if not, I could try again. That knowledge was enough to keep me comparatively calm about the whole thing. I say “comparatively” because I was still extremely nervous, but at least I could be philosophical about the outcome of my UT interview. I got offered the position at UT while still in my final year of grad school. What a tremendous relief–a permanent position and no need to apply for jobs again in two years! I ended up taking the Spitzer Fellowship for just one year while on leave from UT. Having the one year as a postdoc really helped me get my research program going. I had time without teaching or committee responsibilities to publish my remaining thesis papers, complete several new projects, and start a new collaboration. I’m using my postdoc work as a foundation for a lot of the new research I’m doing now as a faculty member. 4. You’ve recently started work at the University of Texas. What drew you to Texas? What factors did you consider in making this decision? Oddly enough, I had lived near Austin, Texas for 18 months when I was 10-11 years old. I was too young to get the feel of the city, but I remembered how my parents had enjoyed it and were sad to leave. I had heard good things about Austin, and when I visited, I decided I would enjoy living there. My husband (then fiance) did his bachelor’s degree at UT and so was able to give me a lot of inside information about the university, the campus, even activities like Bevo’s Birthday. However, the biggest factor in our decision to come to Texas was whether or not my husband would have a job. He is also an academic, so we have a two-body problem. In Pasadena, where I did my Spitzer Fellowship, there are tons of nearby colleges, so we had planned that my husband would work as an adjunct professor in the LA area while we both got ready to apply for permanent jobs together. There are not nearly so many colleges in the Austin area. Fortunately, UT arranged to hire my husband as a lecturer so we could both start working in fall of 2009. 5. What’s it like teaching solar system classes in a Department of Astronomy? Was your background astronomy or planetary science? The Solar System class is a lot of fun because I get to teach a lot of the things that first got me interested in astronomy. I show some of the same pictures I had in my Voyager II poster book, plus the beautiful new Cassini images. Sometimes the students really get in to the class material. They like to know exactly how big an asteroid has to be to wipe out life on Earth, or how long you would free-fall if you jumped off a cliff on Miranda. I also interpret the title “Solar System” rather broadly and include material on the exoplanets–other nearby solar systems! I did my Ph.D. in an astronomy department, but my thesis was heavily planetary–it incorporated work on both Saturn and the exoplanets. The UT astronomy department has a large exoplanet research group, so I’m not alone as a planetary astronomer. There are also scientists who do more conventional planetary research in the Jackson School of Geosciences. We in the exoplanet group are working on setting up collaborations with our geological colleagues. If you’d like to be featured as one of our 51 Women in Planetary Science, send in an abstract of a recently published paper and we’ll send you some questions. If you’re a student, send in a question and we’ll forward it to successful women scientists who can answer your questions about career choices, sequencing, publishing, review panels, and other tips for success. This feature will run every Tuesday and Friday, for as long as we have submissions. dodson-robinson is an unorganized, incompetent, and a disastrous professor. her lectures would go off on tangents and she would speak so pedantically about material not even pertinent to exams. she teaches to non-astronomy majors as if that is our destined vocation, but after her abysmal teaching, she deterred the entirety of the Jana-Harvey auditorium from ever taking another astronomy course again (unless you needed to fulfill requirements). for our quizzes, she would not divulge any information about what we should know and would not even refresh us on the necessary chapter numbers. before our final exam, she failed to return to us our fourth quiz so we could use it to prepare. one girl facetiously yelled to her “thank you for everything, really” on the final exam day and was met with approving smirks and an obvious consensus of the abhorrence we felt all semester in her miserable class. someone inform this inadequate “professor” how to properly instruct a college class because she tarnishes the subject of her astronomy with her loathsome teaching. get her out of here. Sally entertained us last week during a workshop about the really cool, state-of-the-art research she is developing! Regarding that statement: “I also liked photography, so I decided to get a degree in Imaging Science. Then I could go and design printers for Kodak or chips for Intel. I didn’t start thinking about grad school until my junior year.” This illustrates an aspect of the US school system I like very much: the fact that university majors chosen during undergrad studies do not necessarily determine people’s long-term paths. I have heard of US colleagues who did their undergrad school in humanities and could choose to become astronomers at a later stage. France offers much less flexibility: the majors chosen during the first two years of college/university determine most of the time the job you’ll get. I also like the fact that students can decide to take one year of break to do something off the beaten path, something much more difficult to implement in other countries. As a result, the diversity of backgrounds and career paths of colleagues trained in the US is extraordinarily rich! Thanks Susan and Sally! This interview was really interesting to read!